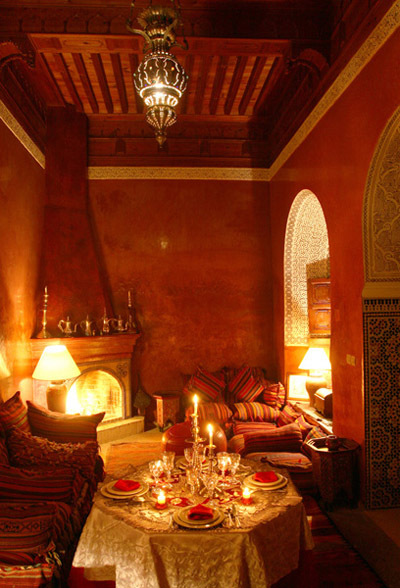 Riad Samsara - Luxury Riad in Morocco. 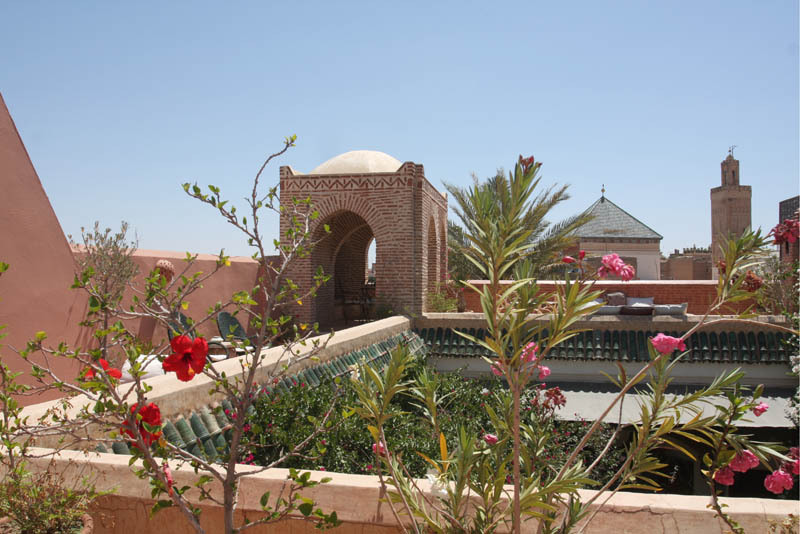 Book Riad Samsara Today with Hip Morocco - Holiday Accommodation in Marrakech, Morocco. "Traditional Moroccan humble luxury: a must see in Marrakech"
Riad Samsara offers guests an intimate stay in Marrakech with generous amounts of beautifully crafted and charming Morocan spaces. This large riad caters for just 3 guest rooms with a very personalised service, something of a real must in the bustling day and nightly life of Morocco’s cultural capital. This Riad in Marrakech has been tastefully furnished with small and large antique Moroccan gems from around the country, giving Riad Samsara a genuine atmosphere of humble luxury Moroccan life. 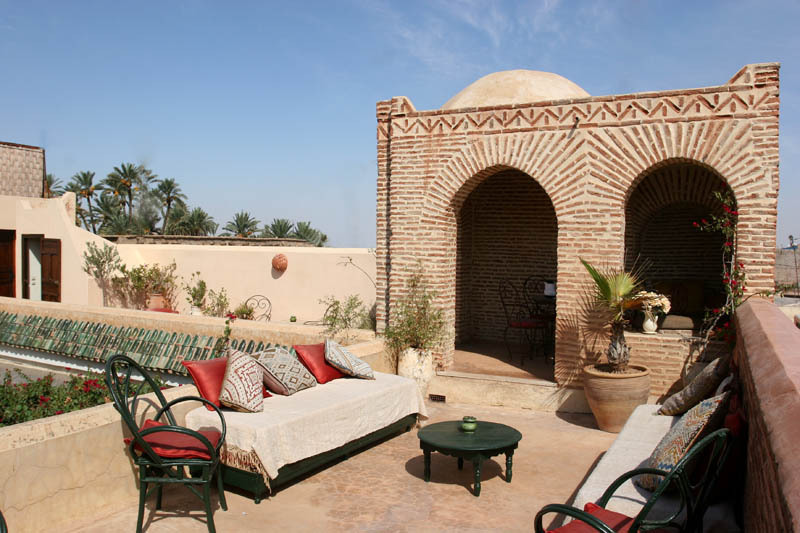 The spacious roof terrace of Riad Samsara has a nice dining area with tables and chairs, plus sunbeds secluded for more intimate enjoyment of the hot Moroccan sun. 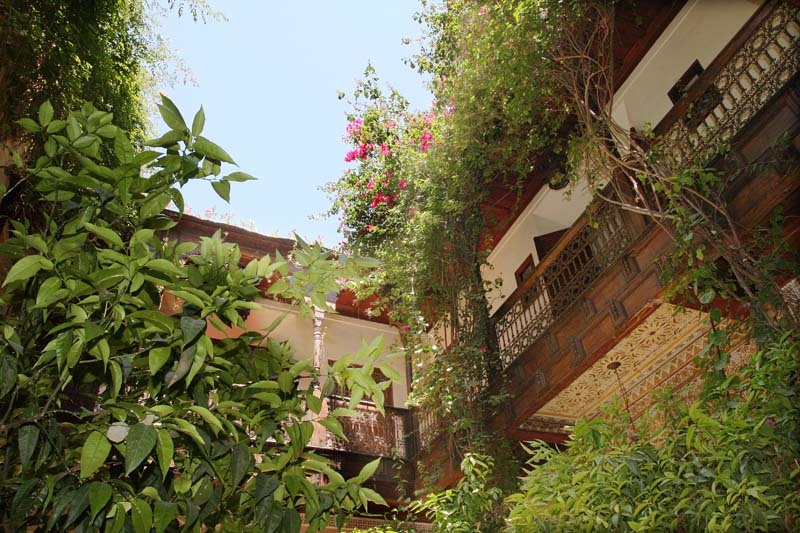 Vined plants colorful and brilliantly green sprout up onto the roof from the central patio giving Riad Samsara a harmonious natural feel. 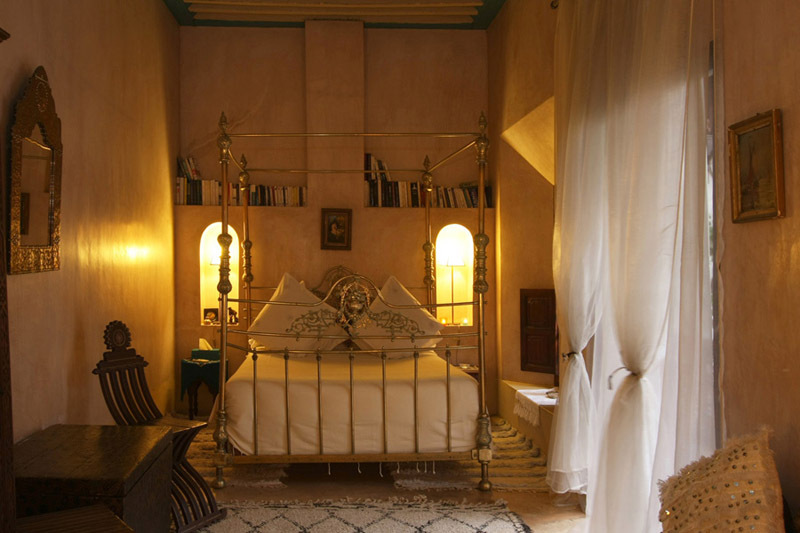 The three rooms at Riad Samsara are decorated in varying styles of tadelakt, the traditional Moroccan building craft to assist in natural insulation and conduction, and have a collection of original Moroccan antiques but all very much individual in style. Rooms at Riad Samsara are presented with a collection of subtle but very welcoming additions experienced upon arrival. 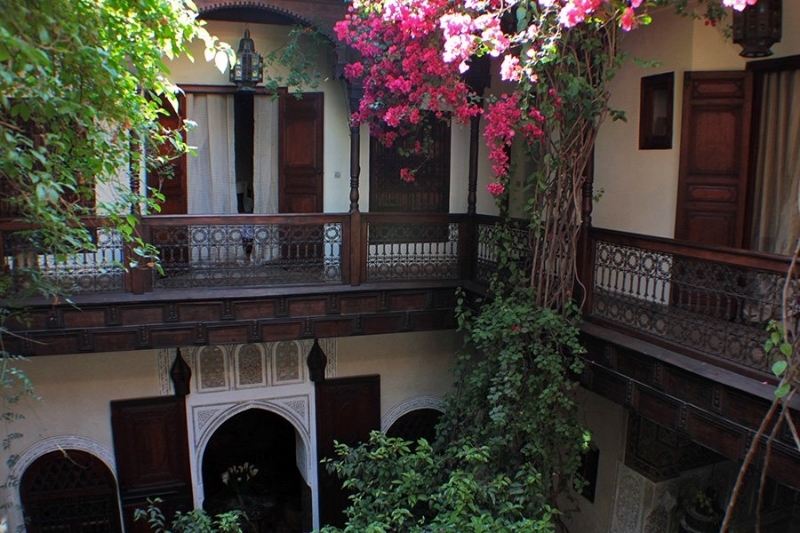 The central patio of Riad Samsara greets guests with small central fountain that trickles water gently over its rose filled centre, as fresh green leaved trees sit around the edges next to vines that run up the walls of the central patio and onto the roof terrace. This Riad in Marrakech has some of the most ornate and beautifully hand sculpted window and door frames in Marrakech, a dying art that is beautifully represented in Riad Samsara. This Riad in Marrakech has two large salons one which is in a traditional grand Moroccan design with low bench cushioned seating and a central table decorated in systematized Moroccan painted style. 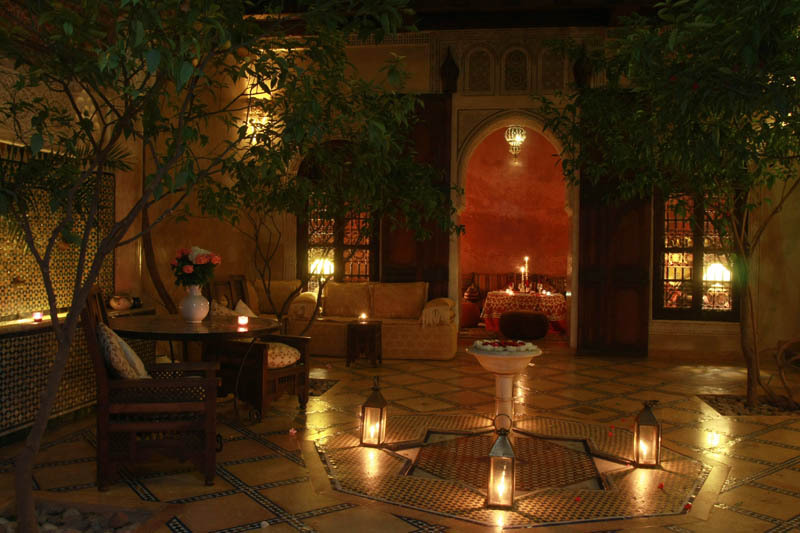 Both salons at Riad Samsara have high ornately designed wooden ceilings and large fireplace. The second salon at Riad Samsara has a more European homely feel but retaining an intimate Moroccan charm with artwork from around the country. Milouda, the excellent chef at Riad Samsara, is happy to prepare the freshest food so as to give you the a great taste of the best Moroccan specialties. 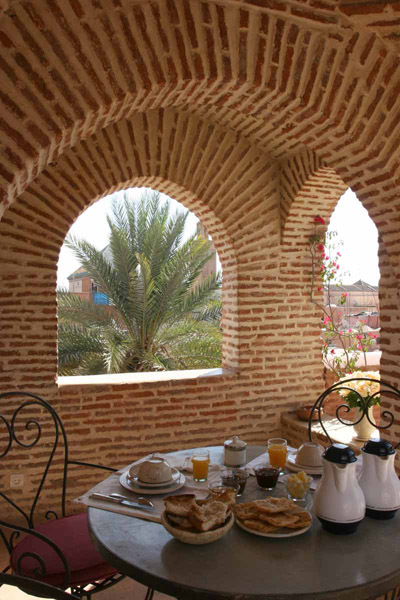 Breakfast, included in the price, changes daily and is a perfect start to an eventful day in Marrakech. Upon request, diners can be prepared at the extra cost of 200 dh ( around £15 per person ). Some of the best Moroccan wines have been carefully selected in order to enhance your diner experience at Riad Samsara. Most guests are happy to go and explore the vibrant city of Marrakech by themselves but, if you feel you would like to know more about the culture and the monuments, Jacqueline and Isabelle would be very happy to arrange for a licensed guide to take you around town, for a day/ half a day. For prices and more information, please contact the Riad. Marrakech is ideally located to go and explore some of Morocco's best preserved spots. A day trip to the Atlas Mountains can be arranged, with a stop over for lunch at Douar Samra, Jacqueline's second property located in a secluded Berber village by Imlil. For ocean lovers, arrangements can be made to take you to Essaouira, a friendly and vibrant little town along the Atlantic coast. Located in a quiet residential area of Marrakech a short walk to the Gare Routiere bus station and Gueliz (new town). 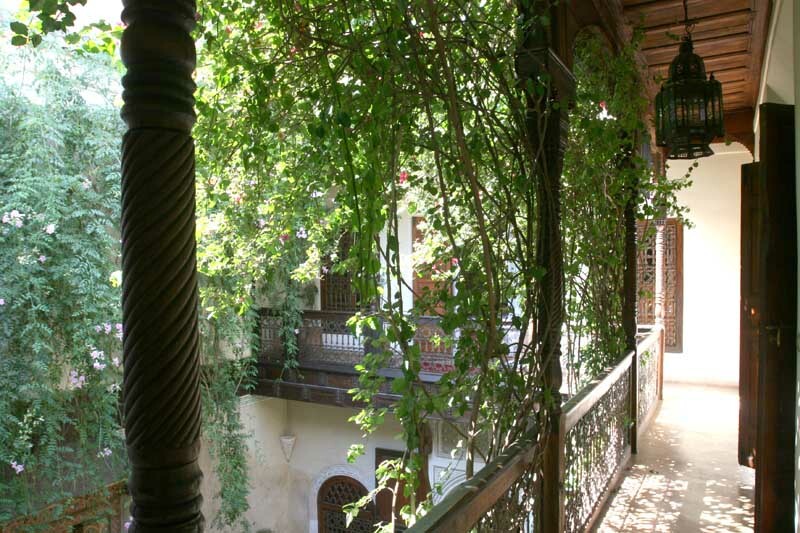 Situated in the North West of the medina, Riad Samsara is close to the wonderfully diverse Thursday Market at Bab El Khemis where you can buy almost anything from the merchants that line the areas pavements each week. The Jacaranda room at Riad Samsara is a spacious double with grand brass four poster bed with separate small seating sofa area. This room has a beautiful collection of Moroccan antiques including a stunningly crafted traditional wooden wardrobe. The ceiling has been created with uniform white wooden beams in a driftwood style. The bathroom in the Jacaranda room is very spacious with double sinks and shower. The bathroom is crafted with beautiful turquoise tadelakt walls and two arched mirrors very well placed alongside a very tasteful collection of toiletries. 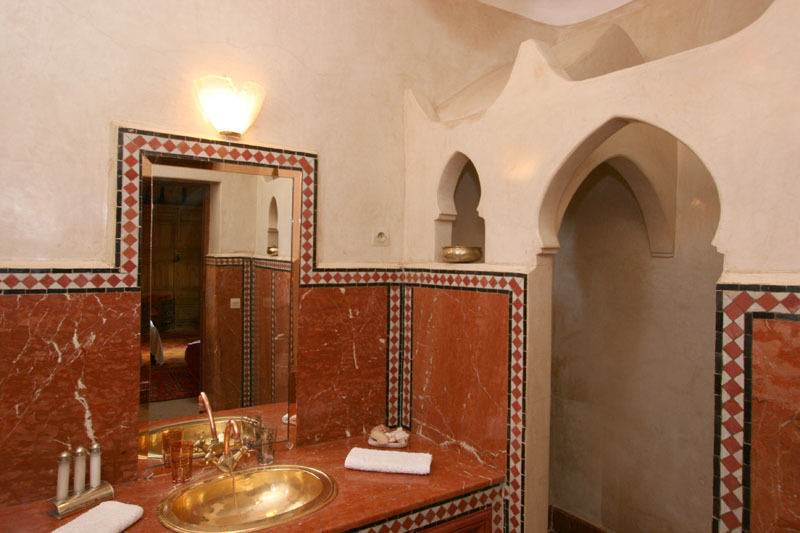 The owners of Riad Samsara have evidently spent plenty of time to create a truly relaxing bathroom atmosphere. 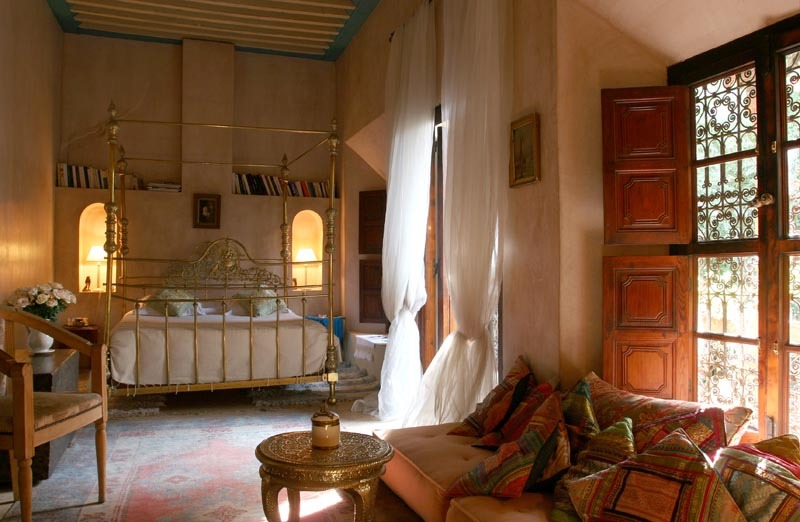 This room at Riad Samsara is cosy but has a very good use of its space. 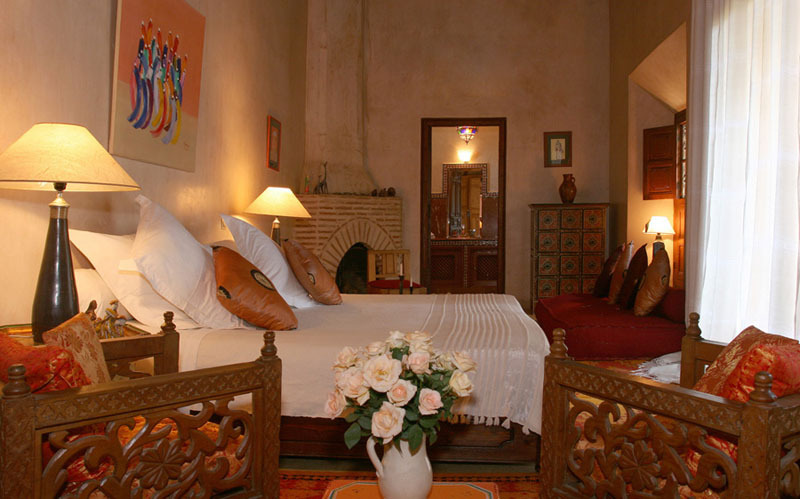 The inviting large double bed has good personal lighting and Moroccan decorated headboards. The ceiling is simple yet crafted in a beautiful boat hull style. 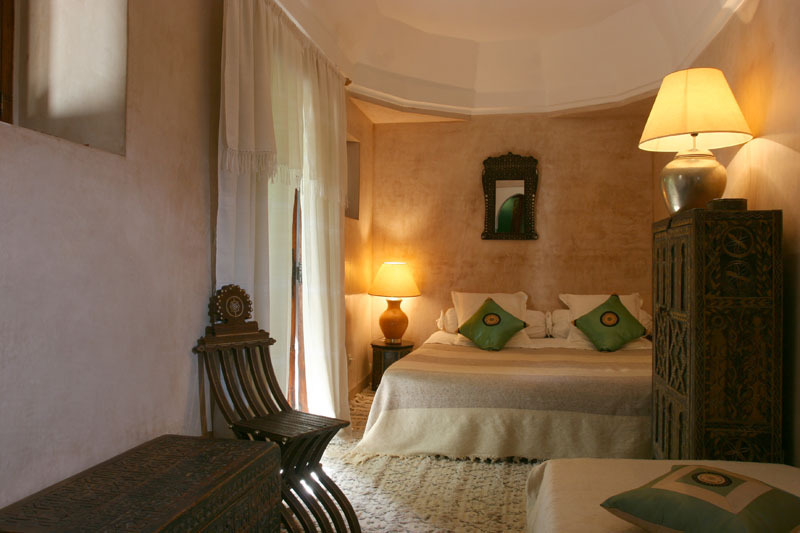 The room is decorated in light chocolate brown tadelakt and small collection of original Moroccan antiques. The Hibiscus room has a large Moroccan sofa that can accommodate an extra person upon request. The bathroom in Hibiscus room has a shower with sensual large mirror built in. The single basin shines brilliantly alongside a nice selection of bathroom toiletries. 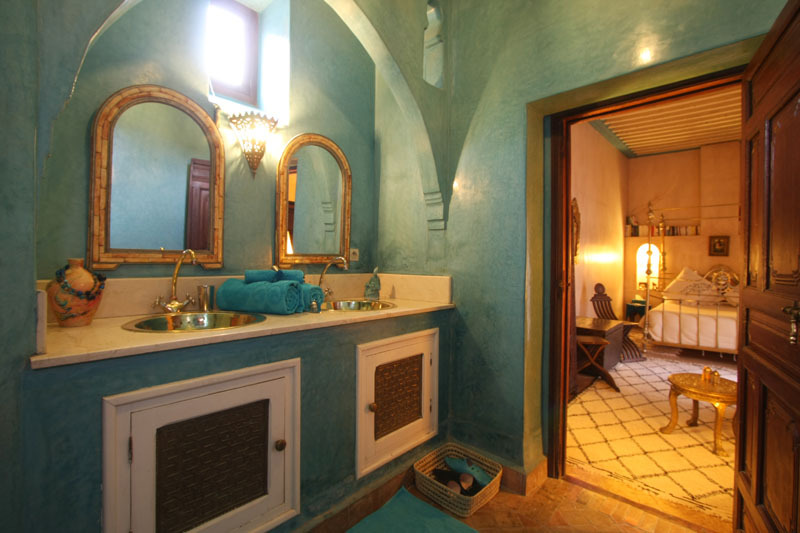 The bathrooms at Riad Samsara are some of the most inviting and well presented traditional Moroccan in Marrakech. The Olivia room is a large double room, the biggest in Riad Samsara, with two seating areas yet remaining with plenty of space. The high wooden hand decorated ceiling is beautifully crafted alongside built in long wooden wardrobes. A perfect room for a romantic holiday in Marrakech or honeymoon in Morocco where guests want some extra space in a wonderfully relaxing setting. The bathroom is decorated in dark red marbled tadelakt with single basin and large mirror. 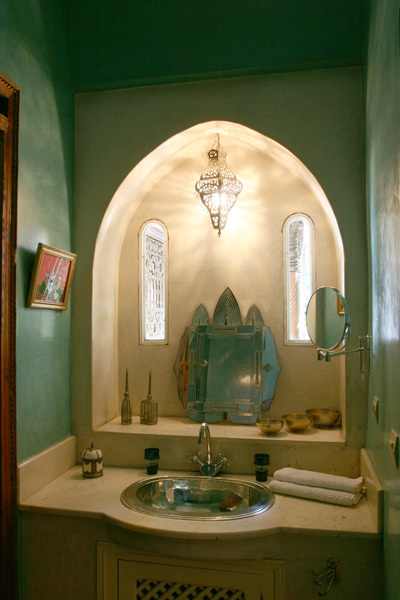 This bathroom in Riad Samsara has a shower and ornate small Moroccan chandelier. 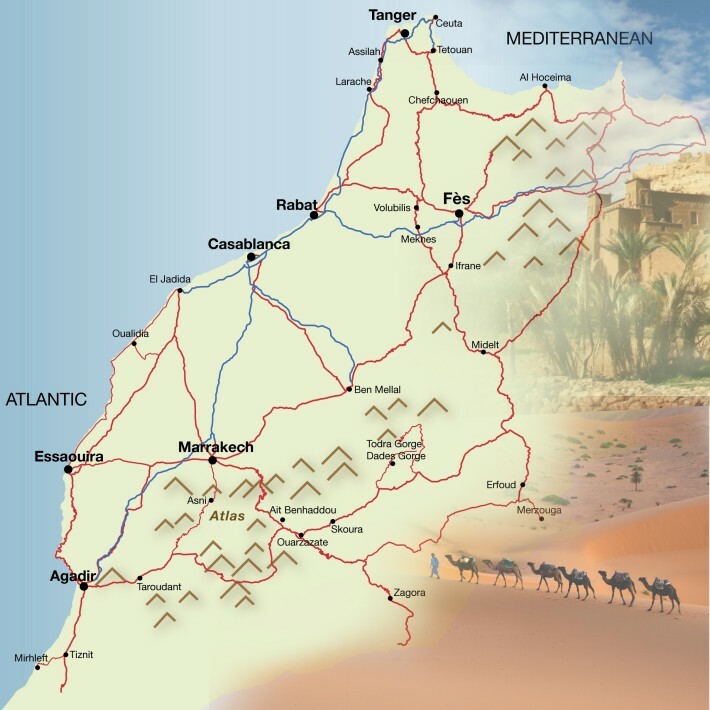 The base rate price at Riad Samsara is in pounds, euros, or Moroccan dirhams and exchange rates are approximate.